Safety and efficacy of AndroGel 1% and 1.62% in men with “age-related hypogonadism”�(also referred to as “late-onset hypogonadism”) have not been established. 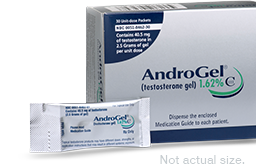 AndroGel is contraindicated in men with breast cancer or known or suspected prostate cancer, and in women who are pregnant, as testosterone can cause virilization of the female fetus and is teratogenic and may cause fetal harm. Avoid unintentional exposure of women or children to AndroGel. Secondary exposure to testosterone can produce signs of virilization. AndroGel should be promptly discontinued until the cause of virilization is identified. Exposure of a pregnant woman to AndroGel may result in potential hazard to the fetus.